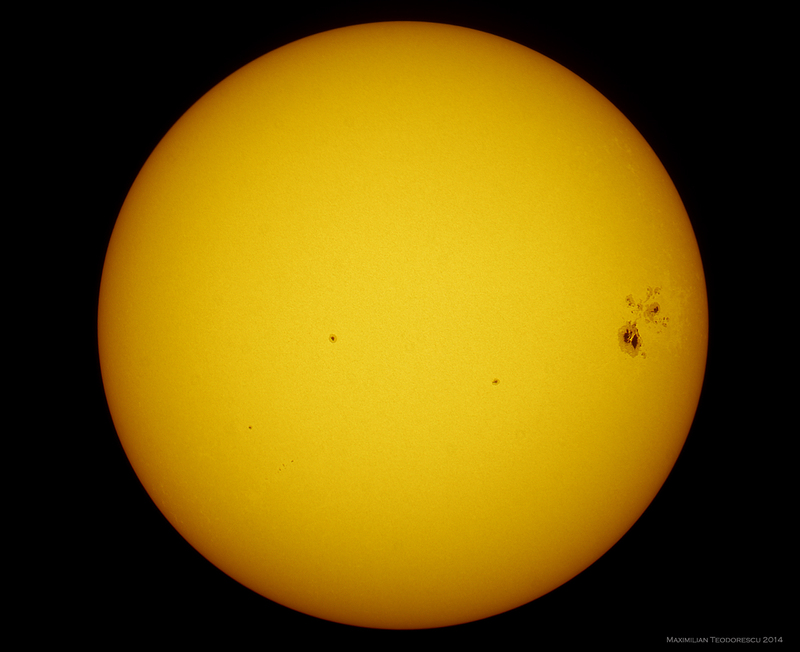 The largest sunspot group in recent years is preparing for departure. At least from the Earth-directed hemisphere of the Sun. 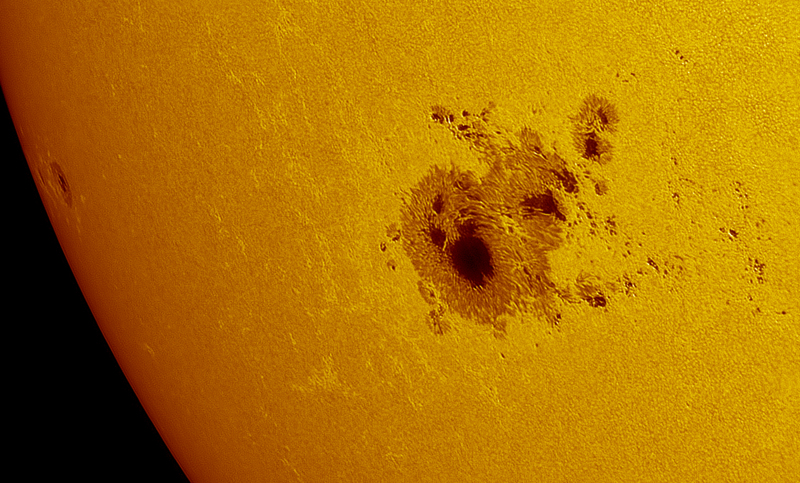 Since we’ve just got here (in Romania) the first snow of this winter and the weather predictions for the next few days don’t look too friendly, I think today’s shots are my last views of this monster sunspot. I’ve got a break in the clouds before going to work today and together with my brother in law I drove a few miles to my usual observing place, in the middle of a field now filled with snow. The seeing was not good (2-4/10), and the temperature was a mere 4 degrees Celsius. 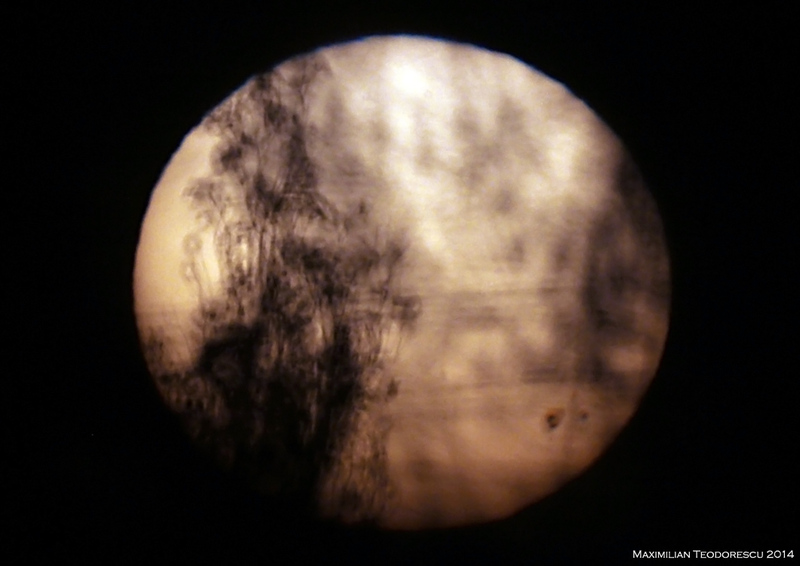 Before installing my gear we both observed the monster sunspot with the unaided eyes through a small solar filter; the spot was very easily observable even between some small clouds. -115mm F/7 APO Refractor from Teleskop-Service, again with Astrosolar full-aperture filter, but with the ASI120MM camera and Baader Green filter. A TeleVue Powermate 2.5x was also used. The images are stacks of 1200 frames out of 4000. 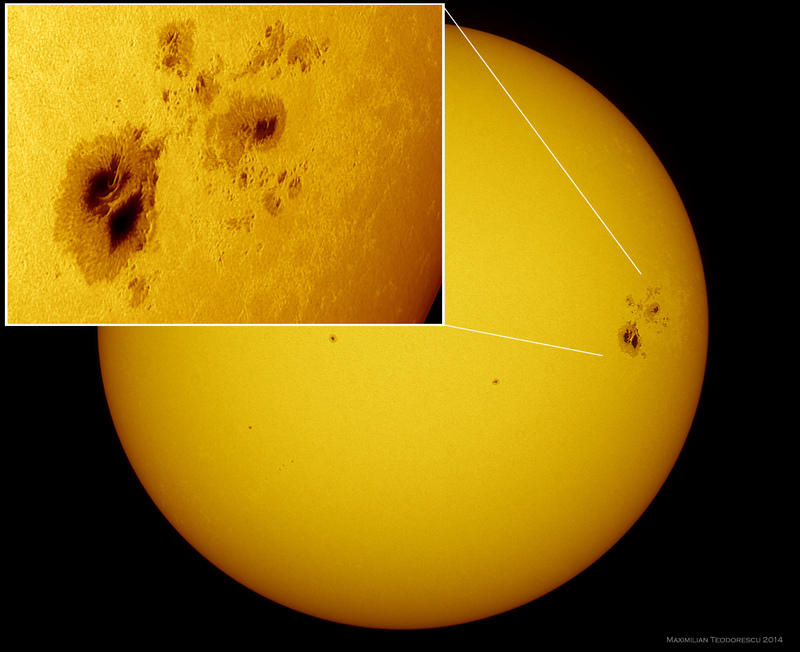 The first image is a composition of the full disc image with a detailed view of the sunspot group. The second image is a comparison of the sunspot group evolution from my first imaging session of it on October 20, and my last one from today. The images are at the same scale, so the size difference can also be noticed, with the main spot core increasing in size considerably (almost double in size on October 27th compared to the October 20th session). Next, a very short animation covering a one hour period of observations, made from 5 distinct images, showing both the evolution of the group and also the rotation of the Sun. Note the inner filament-like structure moving inside the main spot. The following images show the initial full disc image and the detail views which make up the composition at the beginning of this post. And my final image of this sunspot group (if the weather forecast is correct) taken with the small 90mm Mak from my workplace through a small window. 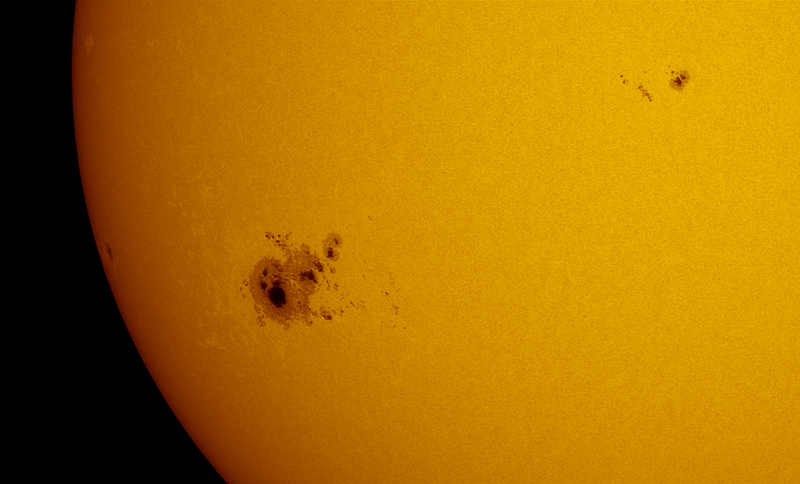 I’m sure this group will rotate back into view since it’s evolution seems to indicate a long life for AR2192. 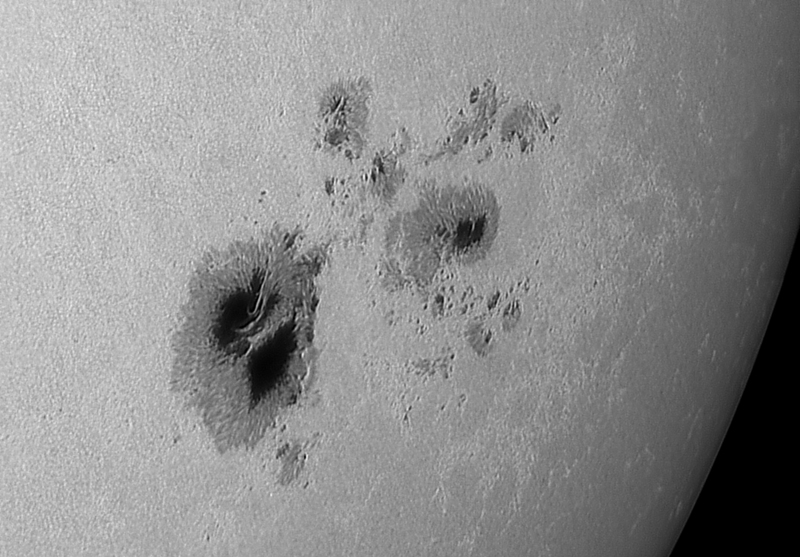 After a very bad session the day before (October 21, under extremely bad seeing) I’ve got lucky enough to capture again the giant sunspot group AR2192 under decent conditions (compared to the previous day). This rapidly changing/evolving group is positioning itself towards us (the Earth). Besides the high probability of X-class flares it’s also showing us a lot more details. This is why I’m trying as much as possible to get some decent images of the largest (in terms of area and sunspot core surface) sunspot group of 2014. The first image was acquired in the focal plane of the 115mm Refractor in rather poor seeing conditions. I am posting it only because it shows just how big this group is, comparing it with the solar disc delimited by the limb. And an animation assembled from only two images (each a 1000 frames stack) acquired over a 25 minute period, showing the rapid changes inside the group. The animation uses the “fade” transition and thus gives the “feeling” of constant evolution which is actually rather accurate in this situation. While I was acquiring the frames for the above images, the seeing was slightly improving, so I’ve decided to increase the image scale by inserting another Powermate in the optical chain. This resulted in some better detail definition inside the group. 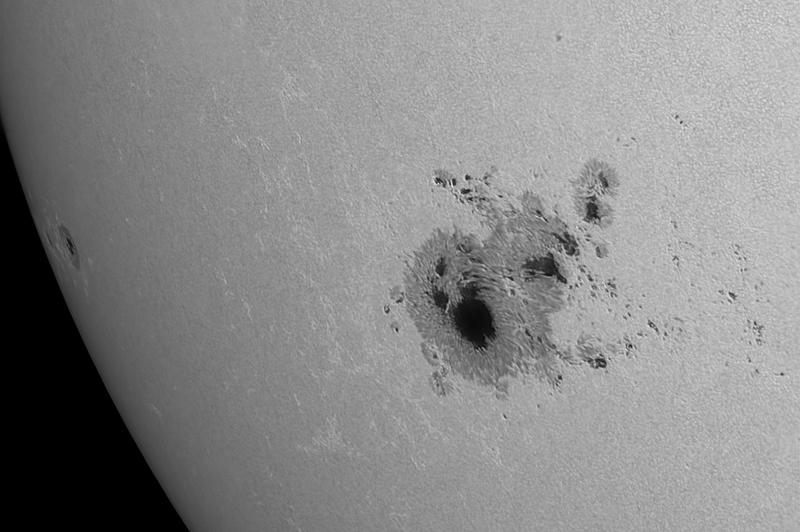 I’m glad that I could make another image acquisition of this impressive sunspot. Hope I will see it again, soon. There is a giant sunpost group on the face of our Sun these days. 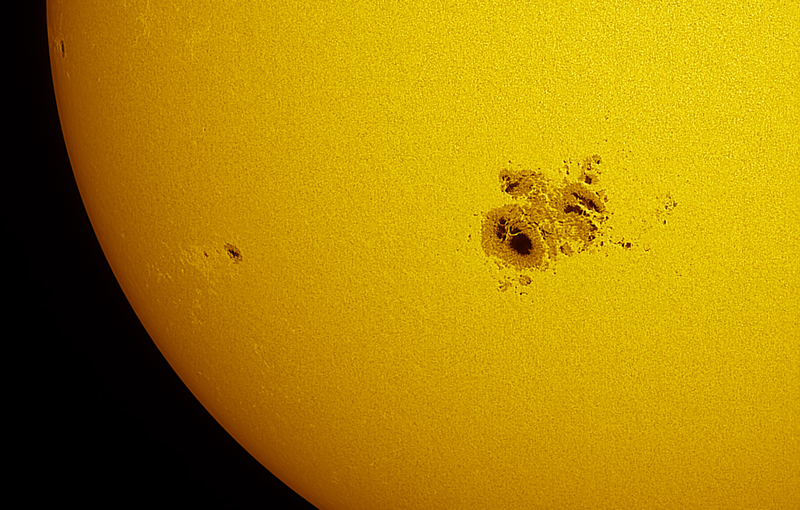 It’s poetic name is AR2192 and it covers an immense area on the solar surface. Of course I had to get some time and acquire some images. The following two versions of the same image were processed in both black-and-white and color to (perhaps) better show the aspect of this group near the solar limb. The equipment was the TS APO115mm F/7 Refractor working at F/18 and ASI120MM with Baader Green filter. The front full-aperture filter was Astrosolar with ND=3.8. Only the best 800 out of 8000 frames were selected, and this was because the seeing conditions were rather poor: 4/10. And a second image of this group, this time shot at F/38. The seeing was fluctuating from 3/10 to 4/10. Despite this, some finer structural details are visible compared to the above images. The final image showing perhaps better the relative size of the sunspot on the solar disc. 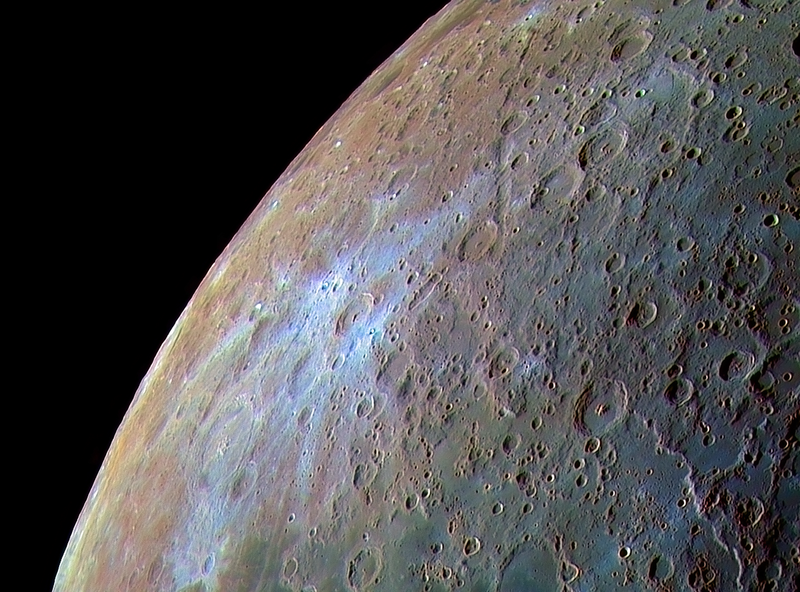 The image was shot in the focal planet of the refractor (800mm). 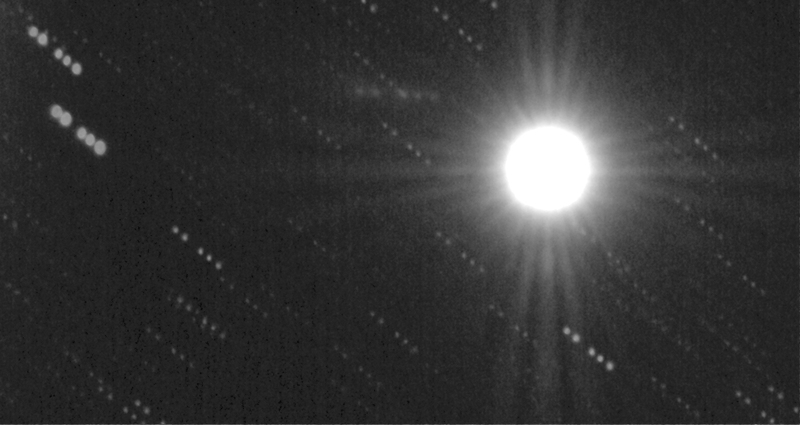 A very rare astronomical event just happened on the evening of October 19th: comet C/2013 A1 (Siding Spring) passed only 132000 kilometers from the planet Mars, that is almost a third of the Earth-Moon distance. In 2013, when the comet was discovered, the prediction was still hard to compute, and there was a slight chance of an impact; eventually the ephemeris of the comet position were computed from a longer period of time and the chance of the comet hitting Mars were reduced to zero. Still, the event remained as one of the most impressive for both professional and amateur astronomers. And luckily enough for our latitude (45N) the event was just visible above the horizon. For “spying” on this cosmic meeting, I had to travel onto darker skies and a location with a low horizon, in the Comana Woods just south of Bucharest, together with my wife and her brother. The equipment used: TS APO 115mm F/7 Refractor on a NEQ6 equatorial mount, and an ASI120MM camera with Baader UV/IR cut filter. Half an hour after the Sun went down I’ve managed to align the mount and prepare the acquisition settings. 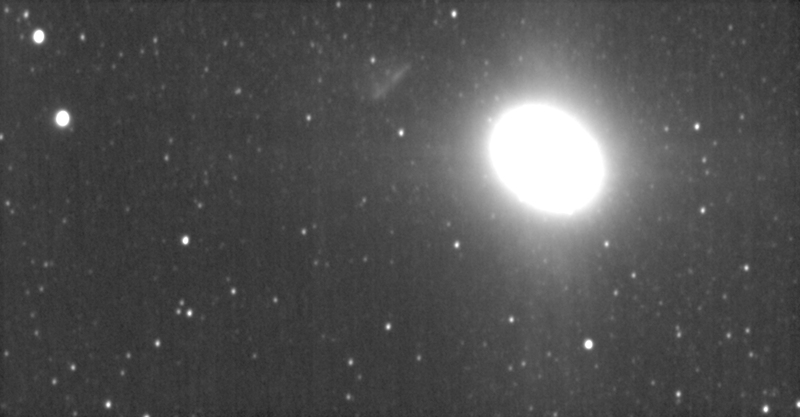 The first target was to see if the comet could be easily visible onto single 15 second frames; after the very first image, the result was positive, despite the rather diffuse aspect of the comet, and it’s +10 magnitude. I will start (for now) with two animations showing the movement of both the comet and that of the planet Mars among the stars. Both animations are made up from 151 frames, each a 15 second exposure. Each of them shows a different perspective: the first shows the movement of both objects with a fixed background of stars. The second shows the scene as it would be observed by a space probe moving at the same speed as Mars. The planet is overexposed in all of the following images; the apparent size of Mars is of course much smaller. I’m still trying to get the best out of these noisy images, so better images might appear later on in this post, but until that moment, I’m posting a few images with this event, with different perspectives. The second shows the movement of the comet (and that of the stars in the background) with Mars in a fixed position. This is perhaps the correct way to show the comet’s approach to the planet. Only some of the frames were used in the image, and thus the distinct shape of the comet is seen onto it’s trajectory in five positions. 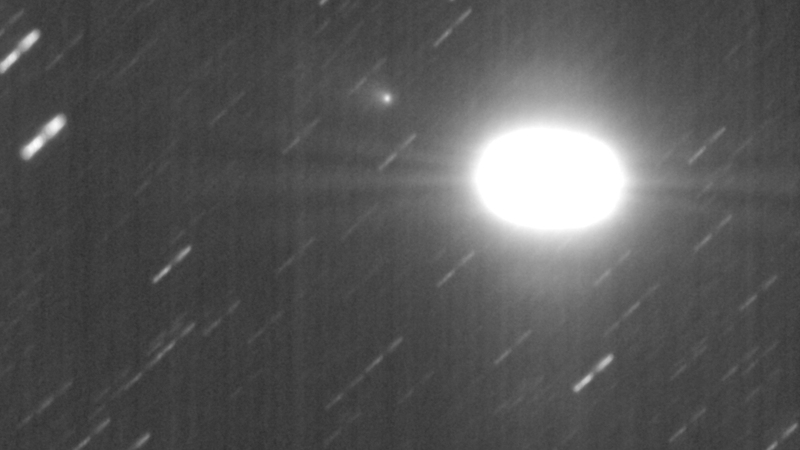 And the last (for now) is an image that shows the actual comet onto a moving background. The strange shape of Mars is the result of the planet’s movement. All of the above images/animations were acquired during a 50 minute period, from 16:30 to 17:20 U.T. One of the above animations was posted on the AstroInfo page. It’s quite rare for my location to have the right conditions for observing the Moon and planets, and it’s actually very rare to have those superb conditions with stable atmosphere when you can glimpse details normally visible in images produced from intense processing of many hundreds of frames. Well, on the morning of October 14 I had just one of those very rare moments at the eyepiece of my C11 telescope while observing the Moon. At a magnification of 600x the details near the terminator where just breathtaking. Of course I didn’t just look through the eyepiece since the +4 degrees Celsius temperatures demanded for something “solid” to take back home, beside the cold I’ve successfully managed to catch. That something was around 100Gb of data acquired over a two hour period. The equipment used for the acquisition of the images was my trusty C11 (280mm in diameter) working at F/20 and F/25 via two TeleVue Powermates (a 2x and a 2.5x one), and the ASI120MM camera with a Baader Red filter. The seeing conditions varied from 6/10 to an memorable 8/10. It seems that October may be the month of choice at my location for good lunar images. 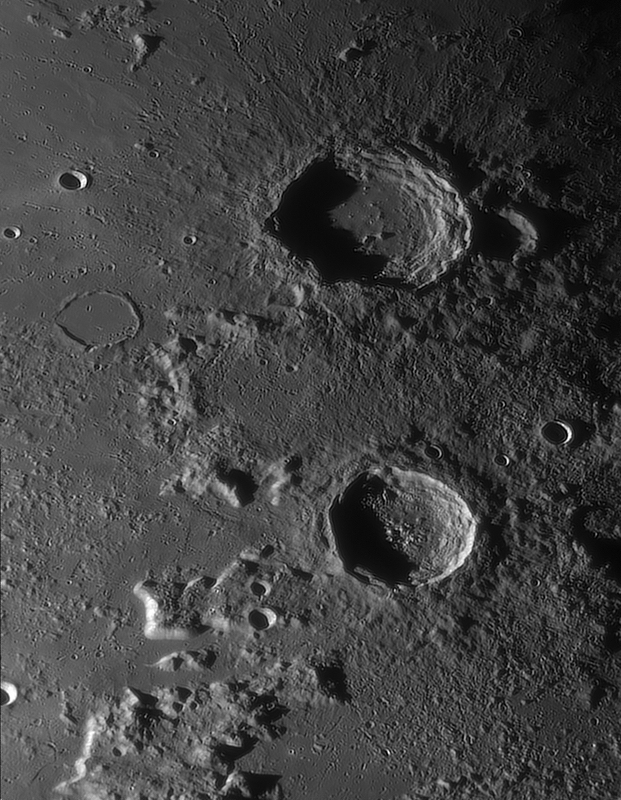 I start with one of the “beautiful” (for me) images, showing the Aristoteles and Eudoxus craters. Aristoteles (up) has a diameter of around 90km, while Eudoxus is around 70km wide. Another “nice” image shows the lunar rougher terrain around crater Abulfeda (around 60km in diameter), just below the center of the image. 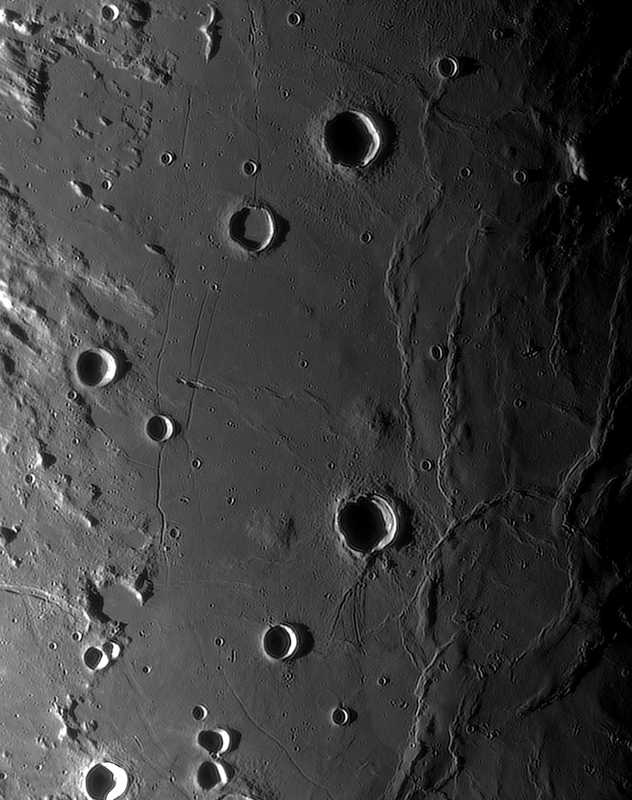 An interesting feature near-by is the chain of craters that go away from Abulfeda towards the upper left corner of the image, properly named Catena Abulfeda. 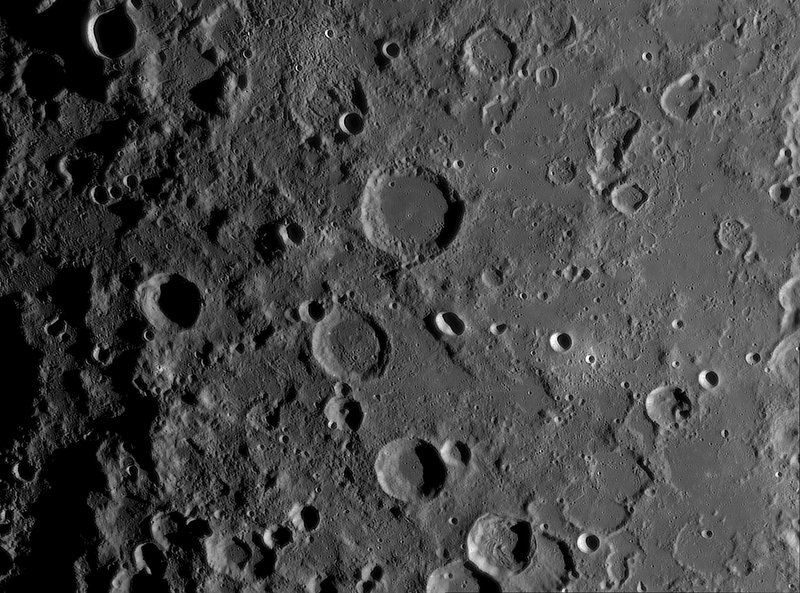 Another very interesting feature is the deformed-floor crater in the upper part of the image, named Abenezra; it looks like the meteorite that form the crater just didn’t stop spinning after it impacted the lunar surface (just a funny observation of course). 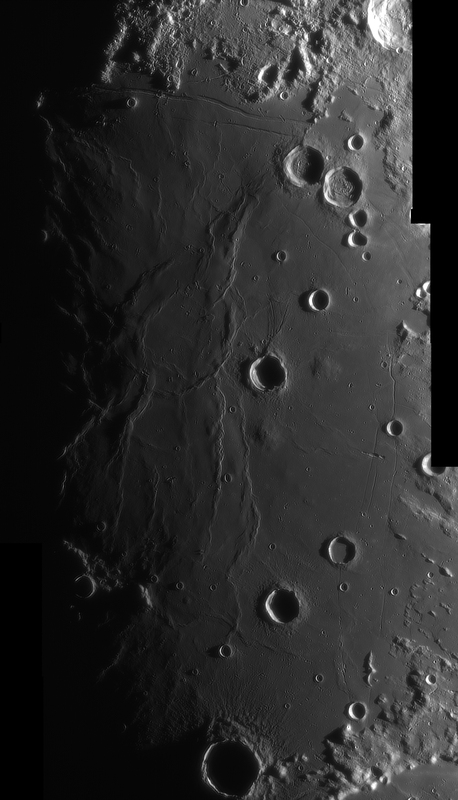 An interesting volcanic area is presented below, showing the Hyginus (left) and Ariadaeus rimae. 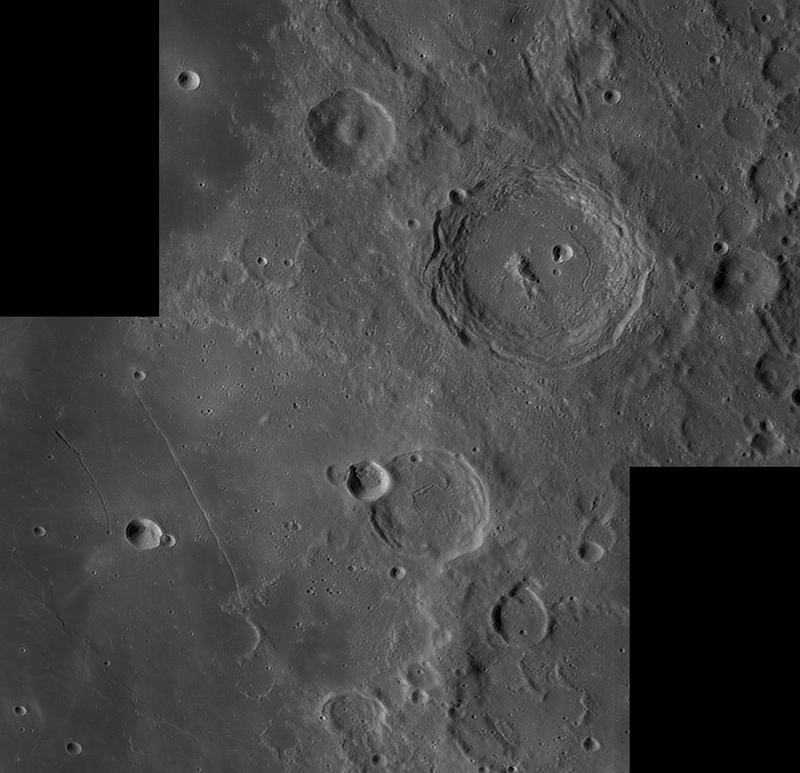 The Triesnecker Rimae is visible just below Hyginus, and also the Sosigenes Rimae can be seen in the right part of the image, together with a very interesting volcanic feature crossing it. Another very interesting and eye-catching area at the eyepiece is the Lamont region presented in the images below. Lamont is the large (~80km) submerged crater surrounded by many complex ridges in the lower part of the images. 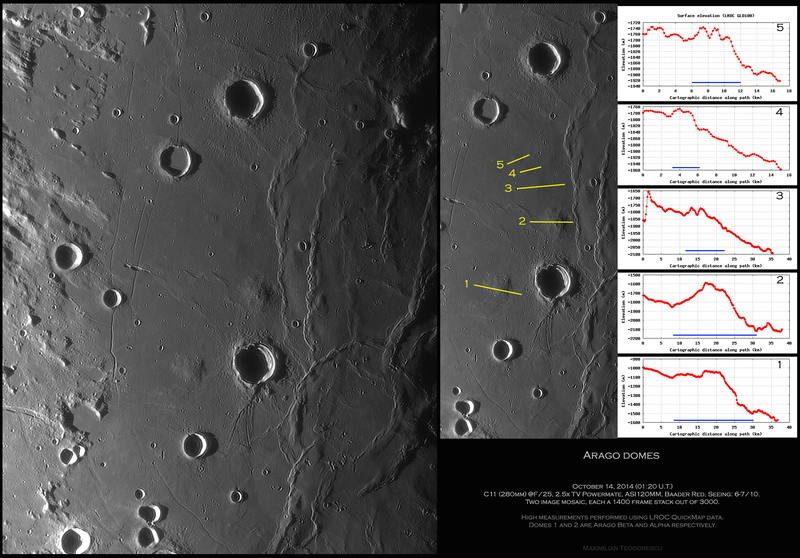 The region immediately around Lamont is perhaps better presented in the following image, which shows the Arago domes near crater Arago (below and right of center) and also the volcanic feature mentioned in the Hyginus-Ariadaeus image above. Using the LROC (Lunar Reconnaissance Orbiter Camera) QuickMap measuring tool I’ve measured the height of some of the domes present in the above images. The yellow lines show my selected measuring paths while the blue lines in the graphs show the approximate diameter of the domes. The Moon has many areas where signs of volcanic activity are present, and perhaps none is more famous than the feature named Ina. 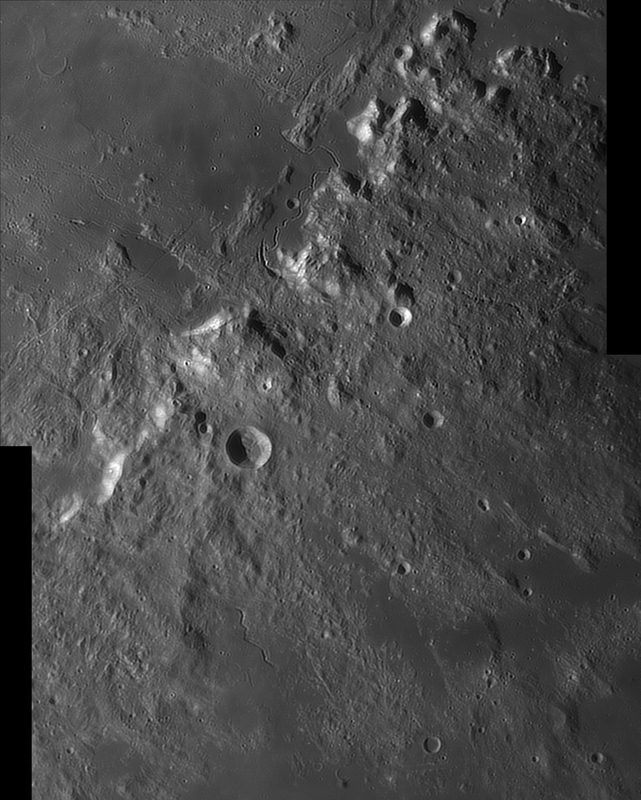 The image below shows the entire imaged area which also includes Rima Hadley (upper part of the image) and part of the Appenninus mountains. The landing spot of the Apollo 15 mission was near Rima Hadley, so this is an historic area for the Moon but also for the humans. 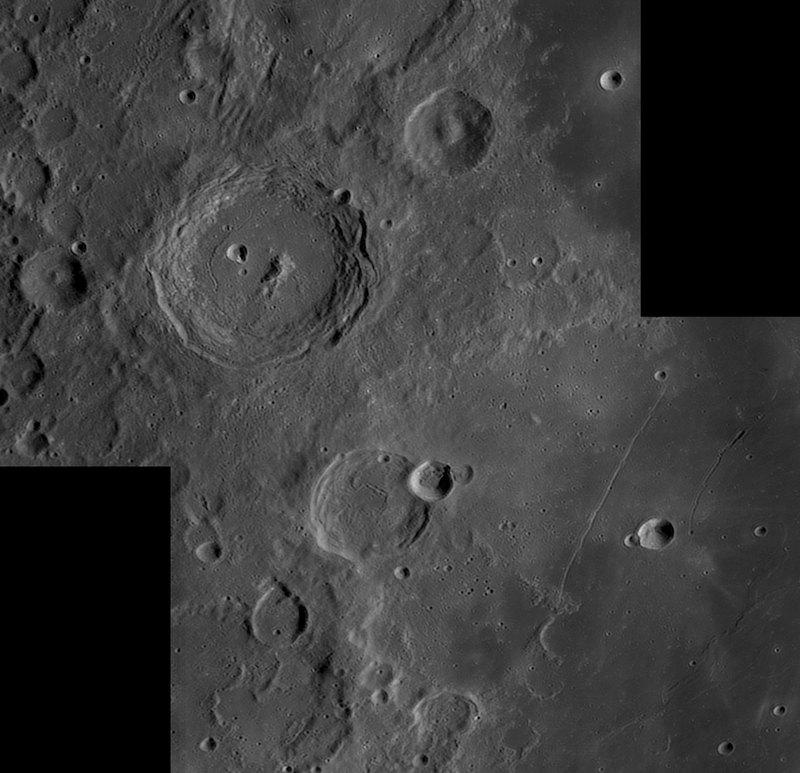 And since Ina is a rather small feature but of a big importance in our understanding of the Moon’s history, I had to compare my images of this area (in terms of resolution) with the “master” of all lunar images, the Lunar Reconnaissance Orbiter. 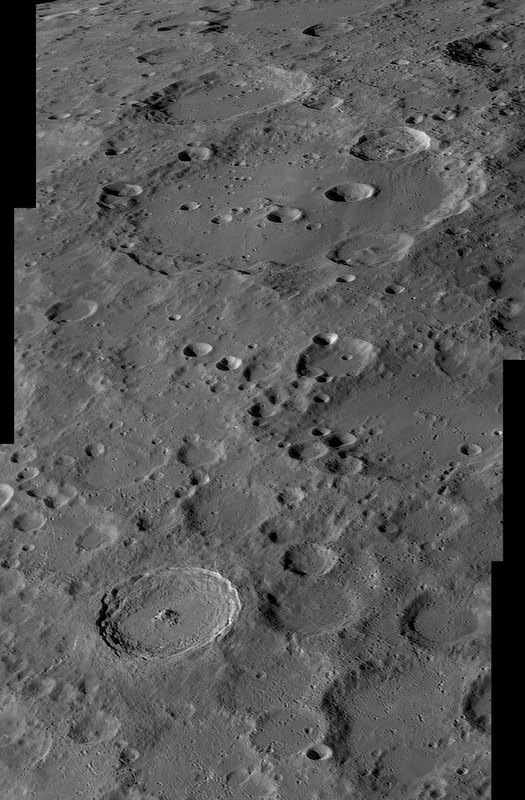 My smallest details imaged with the 280mm scope are a few 800m-wide craters marked in the LRO detailed images from the mosaic below. Bellow is an image of the well-known crater Plato. The detection of the many craterlets on it’s floor represents a good test for the telescope’s optics but also for the seeing conditions. The main image below shows both Plato (left) and Vallis Alpes (right) with it’s inner rima which is another not-so-easily imaged feature. 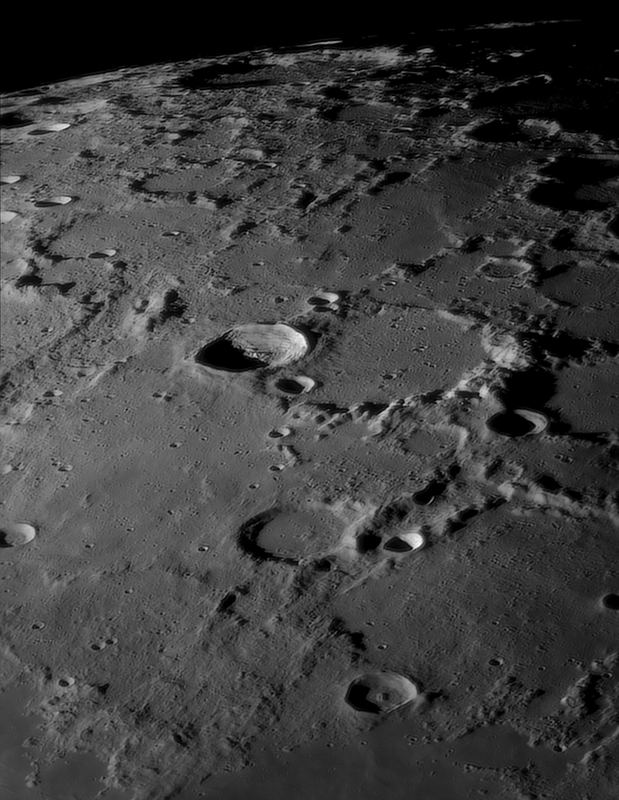 Also, a lot of rimae are present in the image, some extending many hundreds of kilometers on the lunar surface. 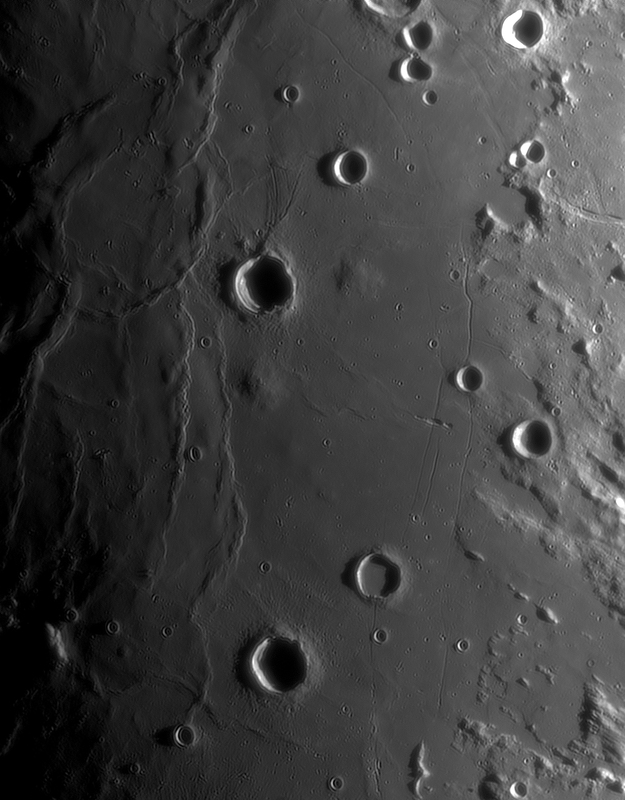 And the resolution test image, a re-processed image from the above one, showing only Plato and around 56 marked small craters onto it’s floor. I’ve only marked those craters which show the tiniest amount of inner shadow, so many other bright spots are ignored, despite being also the signs of small craters. And yet another test-image, showing Rupes Recta (the Straight Wall) and crater Arzachel (upper right of center) with it’s inner rimae system. The very delicate rima perpendicular to the Straight Wall is just visible under this illumination, but (again) this shows that the seeing conditions were indeed very good. 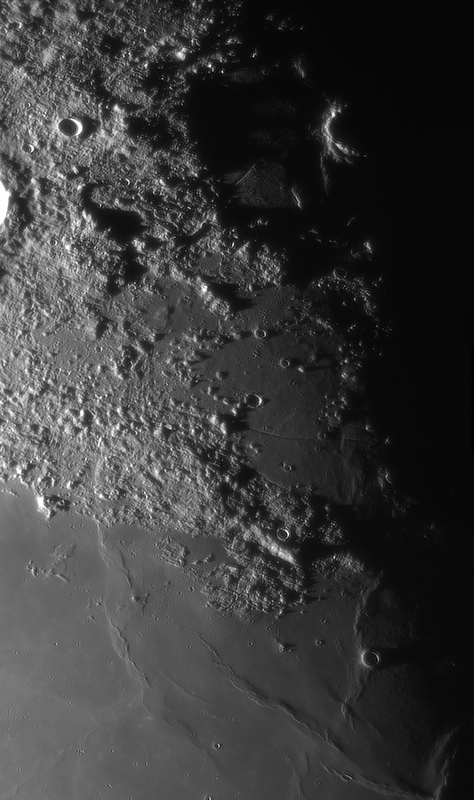 Another interesting area, towards the North Pole this time, captures the Lacus Mortis area just before the Sunset. Crater Burg is visible with it’s illuminated rim on the terminator, and also some of the rimae system onto Lacus Mortis floor are visible. 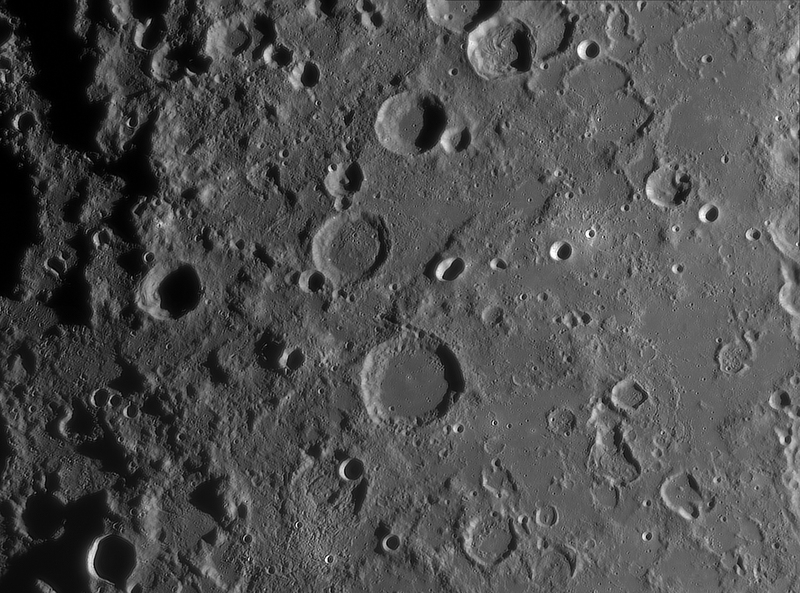 Rimae Daniell (center) seems to continue itself in the lunar highlands (towards the left) for quite some distance. 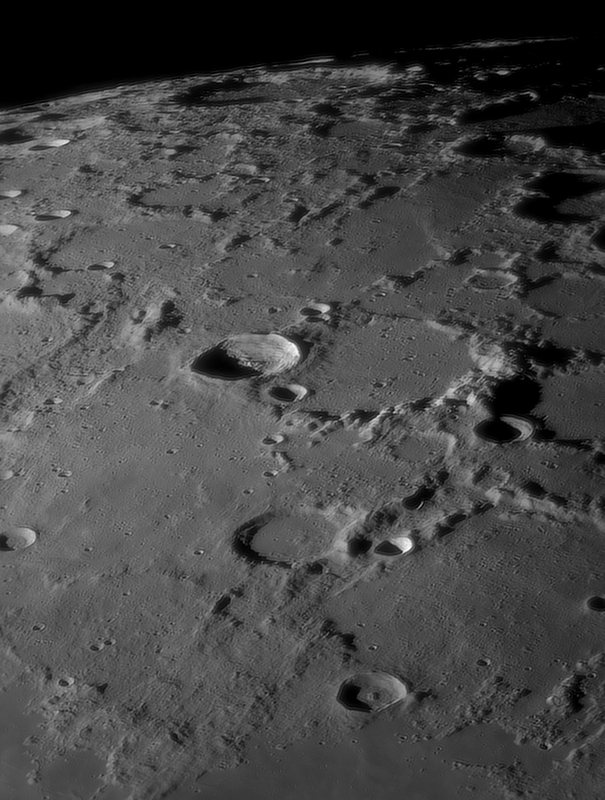 But almost as my laptop battery was getting very low (after two continuous imaging hours in the middle of a field), I’ve decided to acquire some last images of a not-so-often imaged area (by me), the lunar North Pole, with crater Anaxagoras very sharply defined (just above center) and crater Timaeus (lower part of the image) with it’s rather large central peak. I’m starting to reprocess some of the above images from zero. This time I’m trying to process the images to get the smallest details visible and thus to see the actual resolution on the lunar surface. 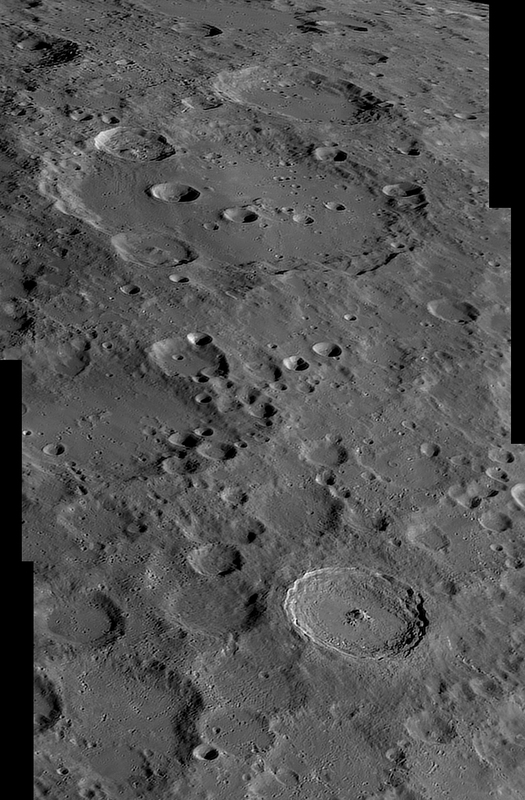 For now I’ve processed only the two mosaics showing the Lamont area; both are resized to 150% due to a 1.5x drizzle. Some of the smallest craters detectable area around 650-700 meters(!). One of the above images was selected and commented by Chuck Wood as an LPOD for October 22, 2014. 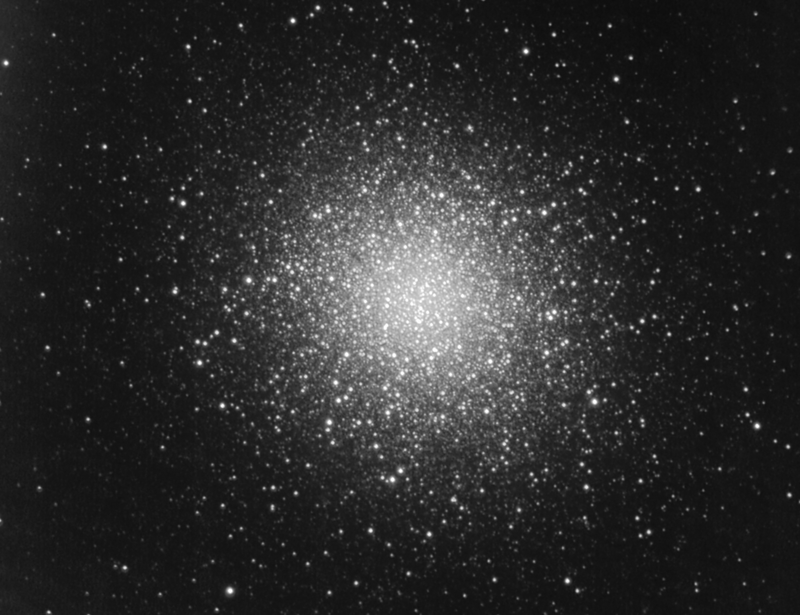 In a previous post I was presenting some LRGB tests with the small TS 65Q APO refractor on the Hercules globular cluster. Now I’m presenting something a bit better: a LRGB result done with the the TS 115mm APO on basically the same conditions. This time I’ve stacked 188 frames, each a 16 second subframe for the L channel, and 3×30 frames for the RGB channels, each a 15 second exposure. The camera was again the ASI120MM with Baader RGB CCD filters and the UV/IR cut filter. On darker skies, let’s say on mag. +7 skies, and with double or more frames, the result should be far better. Lately I had time to do some night-time astrophotography due both to a bit of free time and to clear skies. So, I’ve tried to catch up with lunar imaging and some short exposures deep-sky imaging technique. All of the images below were acquired with the TS APO 115mm F/7 Refractor, at F/7 for the deep-sky images, and at F/18 and F/7 for the lunar shots. The camera used was the ASI120MM with Baader RGB and UV/IR cut filters. First, a different lunar shot, showing the Earth-illuminated part (Earthshine) of the Moon within a few days of the First Quarter. 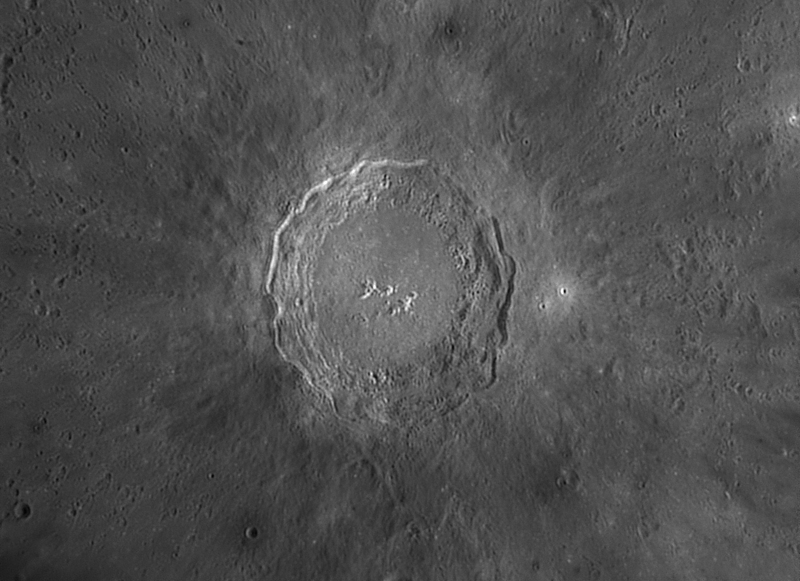 The final image is a stack of 380 frames, each a 1 second exposure through a Baader Red CCD filter, with the refractor working at F/7. The above image might not show many or interesting details, but the simple fact that it shows the Earthshine in close proximity to the Sunshine (overexposed area at right) is what is interesting. Normally one can observe the imaged areas under similar illumination at or very near the Full Moon phase. The second image, again a lunar one, is an LRGB image, meaning that I’ve captured one series of frames using the Red filter, a second one with the Green filter, and the third series with the Blue filter; afterwards I’ve combined them into a single image to render the colors, then I’ve placed the result onto the Red filter image, in which the details were better resolved. All channels were stacks of 600 frames out of 1500, in 2-3/10 seeing conditions due mostly to the very low altitude of the Moon above the horizon (under 19 degrees). The refractor was working this time at F/18. The image above shows an area centered on the apparently double impact (could be possible that it is actually a double impact site?) craters Stevinus A and Furnerius E. Between the two lies Stevinus, the rather well defined crater without “blue” material on it’s floor. Another interesting formation can be seen in the upper-right corner of the image, a large crater with a rimae system inside it’s rim: Janssen. Part of the white-blue materials from the nearby impact craters is covering Janseen’s floor. And now for the deep-sky images…. 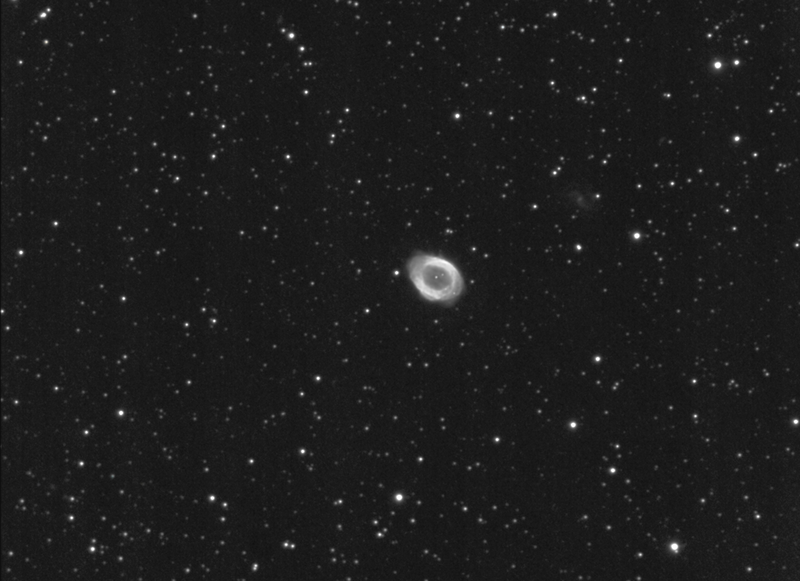 Well, I’ve only got enough time to acquire some sub-frames of a single object: the planetary nebula Messier 57, or “the Ring Nebula”. It’s name is in direct connection with it’s appearance both at the eyepiece or in not-too-long exposures. 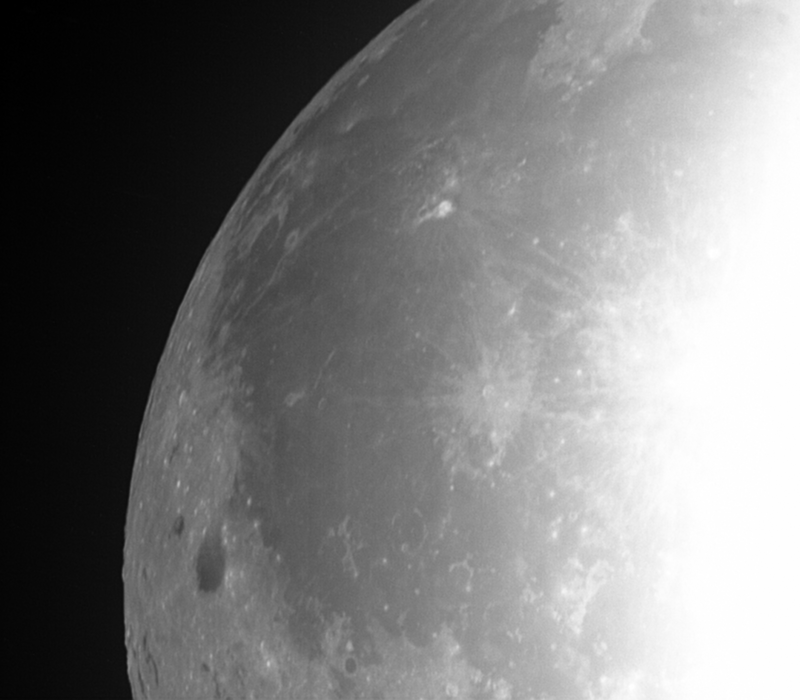 The image above, with the refractor working at F/7, and acquired using the UV’IR cut filter, is a stack of only 50 frame,s each a 20 seconds exposure. The details inside the nebula are the result of 100 frames of 10 seconds each. Due to the light pollution both from Bucharest (to the North) and from the Moon (to the South) the limiting visual magnitude was around +5, but there are some Mag +18 (!) galaxies present in the final image. I’m sure that on darker skies I could go a lot deeper with this setup on this object. For now, I’m posting two slightly differently processed versions of the same image (resized to 148% from original), each with it’s advantages and disadvantages. I’ve also processed a detailed image of this object (resized to 300% from original), again in two ways, one in grayscale, the other being a LRGB version using the color data acquired in the same night (20x12s for each channel). The result shows some rather fine details for a 4.5 inch refractor under far from perfect sky conditions. 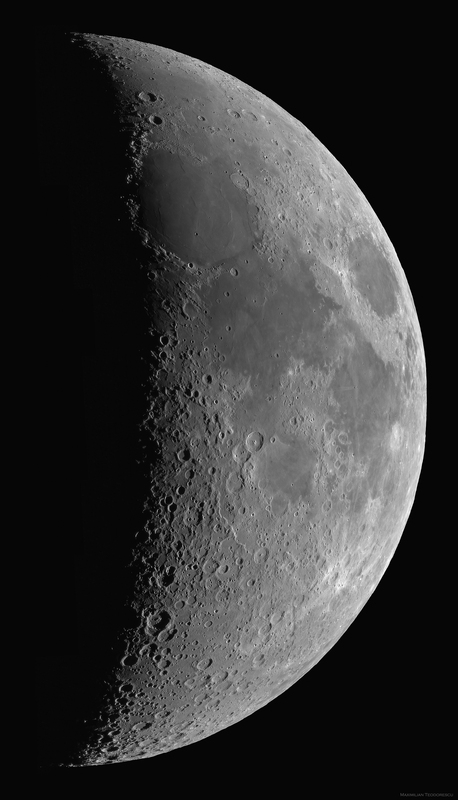 I’ve just finished the mosaic from the September 30th session, with the Moon hanging just 22 degrees above the horizon. The image is a mosaic of 14 zones, each a 450 frame stack out of 1500 in 2-3/10 seeing conditions. The equipment: TS APO 115mm Refractor working at F/18, ASI120MM and Baader Red filter.